Jingle all the way! 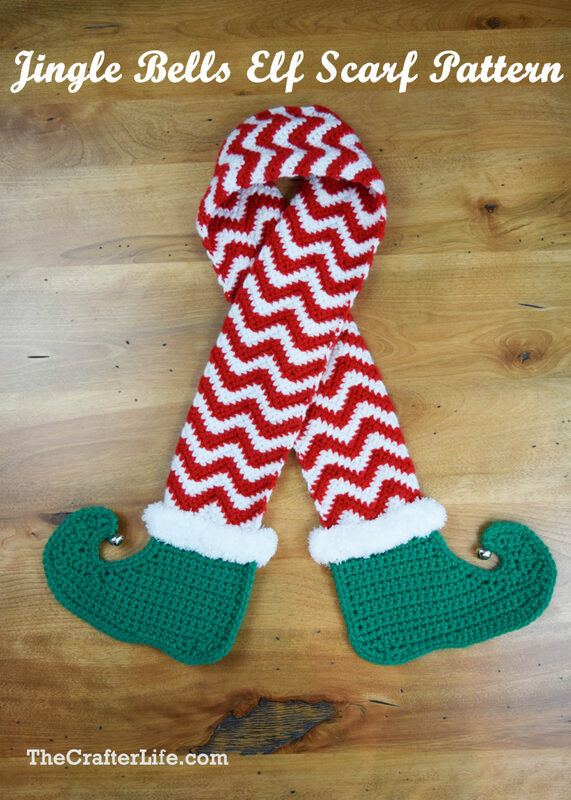 That’s what you will do when you wear my new Jingle Bells Elf Legs Scarf that’s fresh off the crochet hook! My little ones gave me enough time to finally finish it today! I know many of you loved my Witch Legs Scarf pattern so I couldn’t wait to share this one! 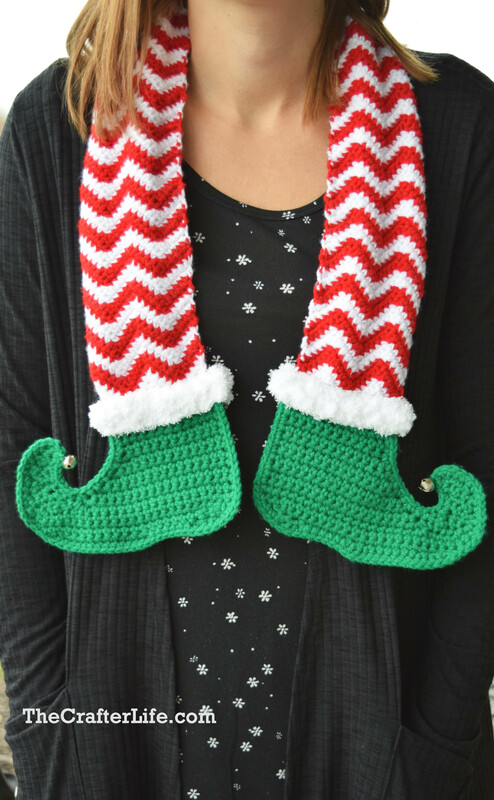 There is still plenty of time left before Christmas so if you are looking for a fun crochet project to get you in the holiday spirit, this is it! With two cute little bells on the tips of the toes, this scarf has the perfect amount of charm to cheer up any wardrobe. 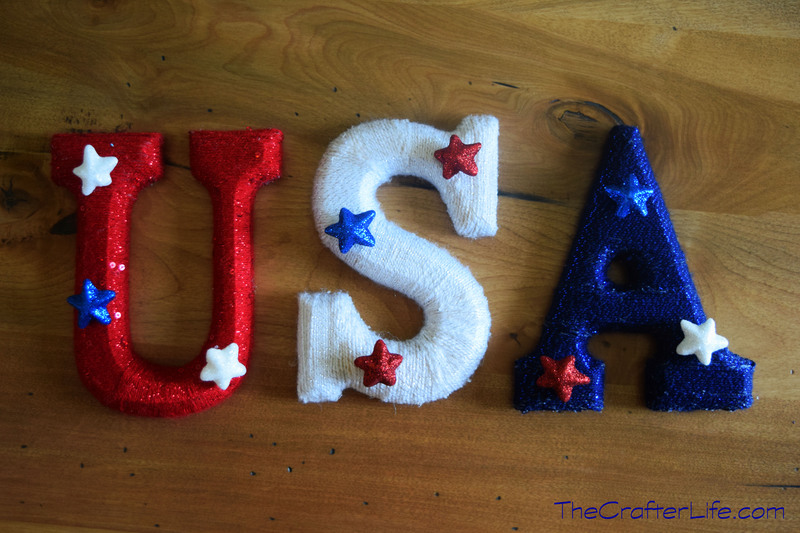 I must say it was fun to hear the little jingle of a bell as I was finishing up this project. This scarf pattern is written for an adult-size scarf meant to fit most adults (and older children/teens). 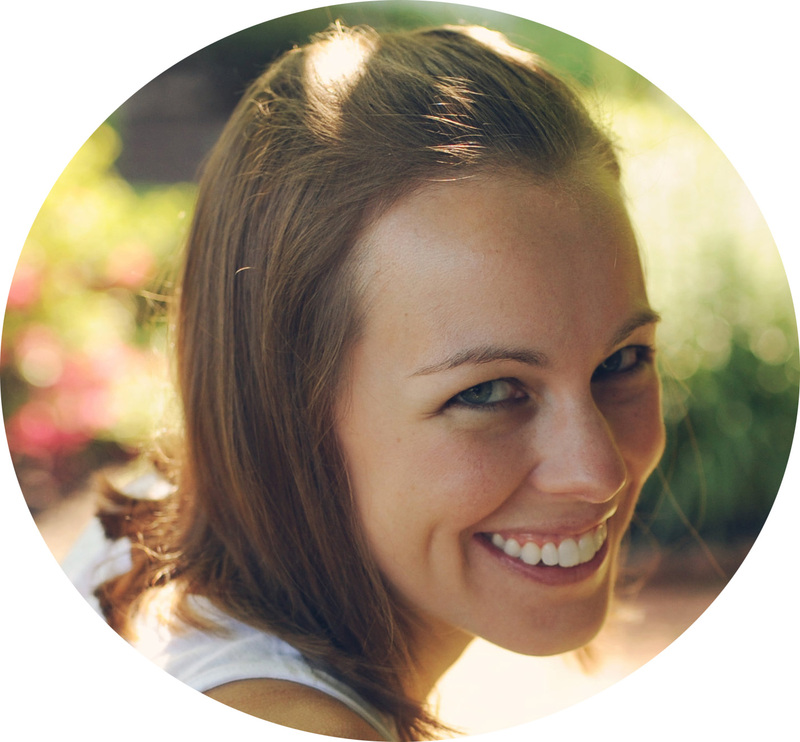 The length can be adjusted by adding or subtracting rows from the body of the scarf. The chevron body of the scarf is made first. The yarn is cut after each color change. When you cut the yarn after changing color, leave a long enough tail to weave in the ends as you work. You can lengthen or shorten the scarf as needed by adding or deleting stripes (each stripe is 2 rows). Make sure to end your scarf body with a white stripe. 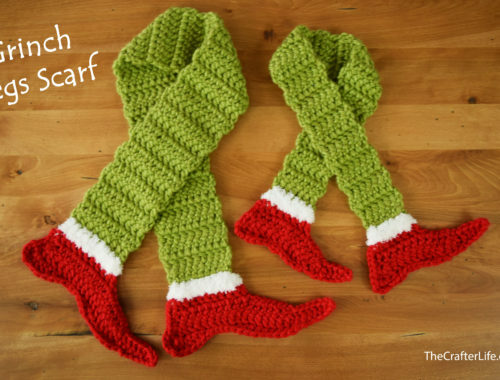 * Use a 4.00 mm hook to create the chevron body of the scarf. Change/alternate colors after every two rows. Rows 7–122: [Repeat Rows 3–6] 29 times. At the end of Row 122, do not join red, keep white yarn attached to hook. ***You should now have a scarf with 61 alternating stripes with both ends in white. You should still have white yarn on your hook after completing Row 122. Next, we need to fill in the triangular spaces at the end of the scarf before we can start the shoe. 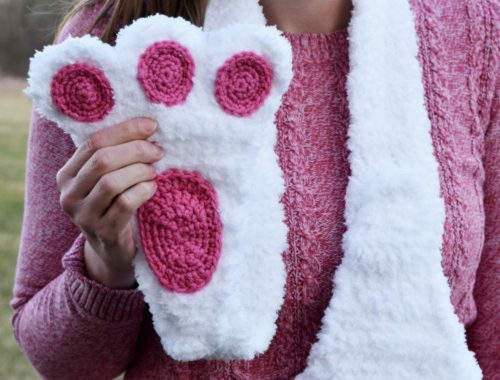 Follow the directions below to fill in the spaces with your white yarn. Ch 1, turn, sk first st/same st as ch 1 (ch 1 counts as first st), sc in next 4 sts, sk next 2 sts, sc in next 5 sts. Ch 1, turn, sk first st/same st as ch 1 (ch 1 counts as first st), sk next st, sc in next 2 sts, sk next 2 sts, sc in next 3 sts. Ch 1, turn, sk first st/same st as ch 1 (ch 1 counts as first st), sk the next st, sc in next 2 sts, sk next st, slst to next 3 sts. *You should now have filled in one triangular space and be at the top corner of the next one. Ch 1, sk first st/same st as ch 1 (ch 1 counts as first st), sc in next 4 sts, sk next 2 sts, sc in next 5 sts. Ch 1, turn, sk first st/same st as ch 1 (ch 1 counts as first st), sk the next st, sc in next 2 sts, sk next st, slst to next 2 sts, fasten off. *You should now have filled in the triangular spaces to create a straight edge and can start Shoe 1. * Use a size I/9/5.5mm crochet hook and green yarn for the shoe. The shoe will point to the same side as you attach your yarn to the scarf. *You should now have 5 chains on your hook. Follow the next set of directions (12a–12h) to make the toe of the shoe. *The toe is now complete. Attach your yarn to the first st in Row 12 (the heel side of the shoe). This will start Row 13 which begins the bottom of the shoe. *The bottom of the shoe is now finished. Use a 4.00 mm hook to attach yarn to top corner on the heel side of the shoe and sc evenly around the perimeter of the shoe until you reach the other top corner of the shoe on the toe side. You should put 4 sc in the tip of the shoe to create a more curled look and put 2 sc in 2 of the corner stitches at the bottom of the shoe to make it more rounded. Fasten off and weave in ends. 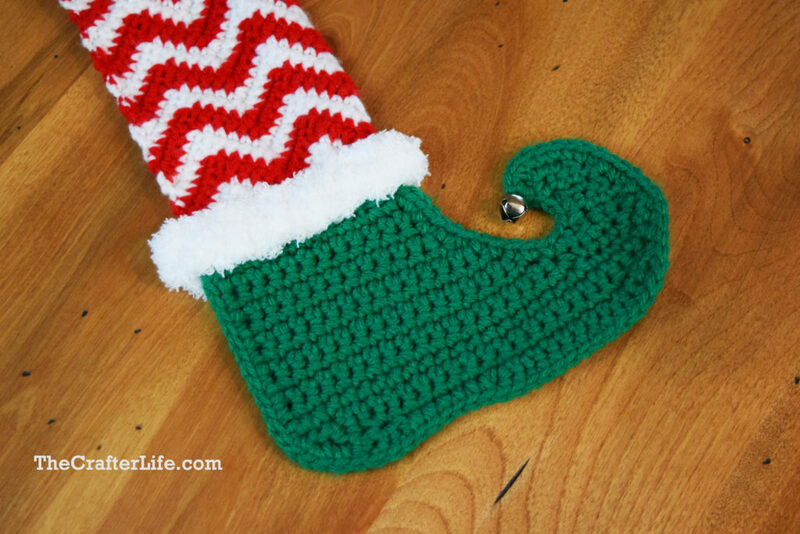 Use a small sewing needle and your green yarn to attach the bell to the tip of the toe. Knot the yarn/make sure the bell is securely attached and weave in ends. *Before starting the second shoe, the gaps in the other side of the scarf should be filled in to create a straight edge. Use a 4.00 mm hook. We will start working in the chains of the starting chain of the scarf. Follow the directions below to fill in the gaps. Hold your work so the first chain of Row 1 of the scarf is on the left. In order to fill in the corner gap, we will work from the first peak of the stripe to the outer corner. Attach your white yarn to the chain space created by the 6th and 7th chains in the starting chain of the scarf (the large space at the first peak of the white stripe). Ch 1, sk first st/same st as ch 1 (ch 1 counts as first st), sc in next 2 chs, sk next ch, sc in last 2 chs. Ch 2, sk first st/same st as ch 1 (ch 1 counts as first st), sc in next st, sk next st, sc in next st, slst to ch sp made by the 6th and 7th chs of starting chain (same sp as white yarn was attached in Step 1). *You should now have filled in the first corner gap. Pick up from your slst in the last step to start filling in the triangular space next. Ch 1, sk first st/same st as ch 1 (ch 1 counts as first st), sc in next 4 chs, sk ch sp created by the 12th and 13th chs of starting chain, sc in next 5 chs. Ch 1, turn, sk first st/same st as ch 1, sk next st, sc in next 2 sts, sk next 2 sts, sc in next 3 sts. Ch 1, turn, sk first st/same st as ch 1, sk next st, sc in next 2 sts (the 2 sts normally skipped), sk next st, slst to next 2 sts so your second slst is in the ch sp created by the 18th and 19th chs of the starting chain (the second peak of the white stripe of the scarf). *You should now have filled in the middle triangular gap. Pick up from your last slst to the ch sp at the second peak of the first white stripe to fill in the other corner gap. Ch 1, sk first st/same st as ch 1 (ch 1 counts as first st), sc in next 2 chs, sk next ch, sc in last 2 chs. Ch 2, sk first st/same st as ch 1 (ch 1 counts as first st), sc in next st, sk next st, sc in next st, slst to ch sp made by the 18th and 19th chs of starting chain (same sp as you started in Step 6), fasten off. *You should now have filled in the other corner gap and have a straight edge across the end of the scarf. Weave in loose ends and then follow the directions below to begin making Shoe 2. 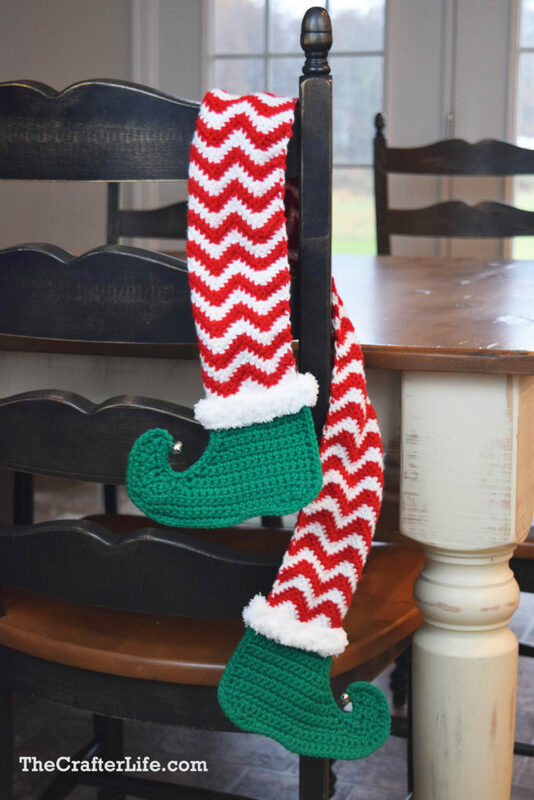 *Use a size I/9/5.5mm crochet hook and green yarn for the shoe. The shoe will point on the same side as you attach your yarn to the scarf. Orient your scarf as if you have it around your neck in order to figure out which side to attach it. Once you attach your yarn, follow the pattern for Shoe 1 to make Shoe 2. Stop after Row 16 and follow the directions below for finishing Shoe 2. *The bottom of the shoe is now finished. Use a 4.00 mm hook to attach yarn to top corner on the toe side of the shoe and sc evenly around the perimeter of the shoe until you reach the other top corner of the shoe on the heel side. You should put 4 sc in the tip of the shoe to create a more curled look and put 2 sc in 2 of the corner stitches at the bottom of the shoe to make it more rounded. Fasten off and weave in ends. Use a small sewing needle and your green yarn to attach the bell to the tip of the toe. Knot the yarn/make sure the bell is securely attached and weave in ends. *Use a 5.50 mm hook and white fuzzy yarn to follow the pattern below for the cuff of the shoe. *Follow the below directions for attaching both cuffs to each shoe on your scarf. Thread a tapestry needle with the long tail left on the cuff so you can attach the cuff to the shoe. Wrap the cuff around the front of the top of the shoe so the two ends meet in the back. Sew the two ends together first. Next, sew through both sides of scarf by going through the cuff on each side along the bottom edge of the cuff. Once you get to the other side of the cuff, sew across the top edge of the cuff in the same way. Once your cuff is securely attached, fasten off and weave in loose ends. Once you have attached the cuff to the top of each shoe, your scarf is finished!